Merry Christmas all, I wonder what you are wishing for Christmas. I would love to try a new magic Muller if Santa is reading, as I just can not get one. I am an equipment junkie, always have been with my hobbies, I still have all my rock climbing gear. Barrels, Stocks, triggers, scopes, and tunners are pretty well known, tried and tested. This year I have been lucky to play with some new actions. I sold my Baitys Falcon and Blackhawk rifles and built up my current rifle on a 3 lug Turbo. Its tough to use with the heavy bolt lift but I can not fault its performance and I have not done a thing too it. I have listened to one of Australias most experienced shooters tell me of the many hours he he had to put in blue printing his Turbo and it does shoot amazingly well. Then I read with interest on a USA website the trouble Ben had with his, I must have got lucky with mine but I will use the off season to strip the bolt and inspect the internals. I have had a lot to do with Stiller 2500X actions importing and building the first ones in Australia and I love them. In my opinion they have the highest build quality and are the current go to action, but also are the most expensive. However I like 3 lug actions. We do now have other options, with the Holeshot Arms Trident and team 10X X3L. The Trident is out of Jerry Stillers new factory and is a 3 lug version on the 2500X. I have had a close look at 2 of these and built 1 up and I am impressed, same high quality with an extra lug but still a high price tag. The 10X I have wanted to try for years but could never get 1 exported, but this year I got one. I have not had the time to build it up yet and maybe I will just sell it however it looks the part and is a much better price. So what surprise would you like to find under your Christmas tree? Not a lot, just the stuff which works in my rifle as the 2014 Tenex has all but gone. Just enough for next year's IRB nationals and Spain. Have managed to find some 2017 Tenex for the light rifle(2 lug turbo /octagon sporter barrel) that shoots around 0.180" for the average of 5x5 shot groups which is better than I can see with a 6x scope. Trouble is it wont shot for s..t in the 3 lug rachet. I do have a brick of 2017 Tenex to test when it gets a little cooler so that may just be santa's present. Oh.... then there's the centrefire stuff but that's another story. I'm in two minds about actions. The falcon shoots well and I don't know weather a supposedly better action would help because I don't read the wind well. I would probably be better of buying more ammo and practicing more. If I was going to buy a new action then it would have to be a 2500x. I am waiting patiently for Jerry Stiller to build me a Trident/Shillen rifle at the moment and I am getting Jerry to do two barrels for me. But I may put it in my Falcon sporter rifle and give it a go real soon, one thing for sure is I am not touching my Falcon heavy rifle. I got to shoot a Trident rifle in the USA and I must admit it was one fantastic gun, finger of God type rifle it hit everything I aimed it at with ease. Same rifle shot a 250-24 dot at a competition at the Triple crown and believe it or not tied for first place but then won on count back. That is what has me so excited about the rifle that Jerry is building me at the moment I know it will take ages to come in through customs etc but I think about it every day . The Triple lug turbo I have is really showing some promise now as it always has but has taught me so much about what makes a action work. But I am working on something at the moment that may have fixed this but not tested it yet. 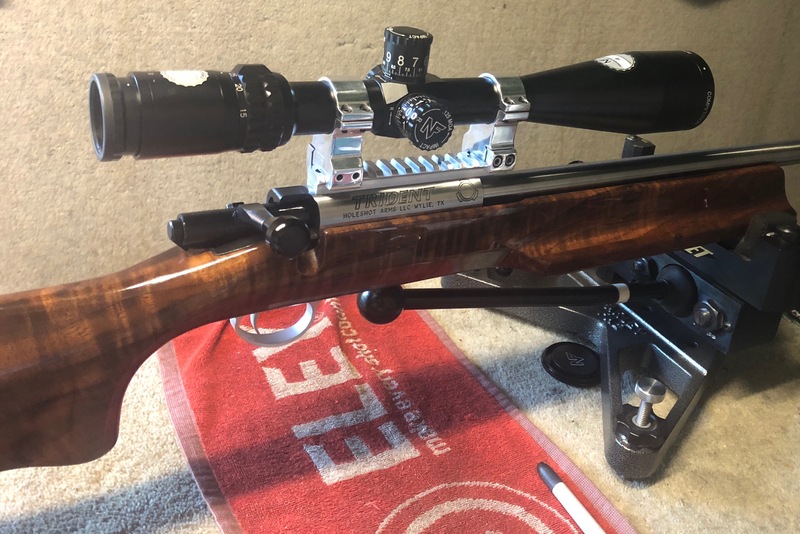 I have thought a lot about this and I hope I don't sound to stupid but if the people that shoot benchrest weren't as decent as they are, I would stop tomorrow. Love everything about shooting but kind of think that the people involved that I shoot with are what makes it what it is. I finally have found the time to build the Team 10X 3 lug action into a rifle. Current set up is with a Shilen 4R barrel, Harrel Tuner, Jewell Trigger, 10X scope bases, Bigstick Bamboo stock, KSS trigger guard. For testing I have my spare Weaver T36 fitted. I am very happy with the final product, testing begins Tuesday next week. I will provide an update next week after the test. Sadly I have had to sell this to fund the trip to Spain. Great news your Trident has arrived they are a nice action. A picture would be great and a report after testing. What's with the paint? Looks like someone played with it before it was dry. Its a special effect put into the paint job, quite amazing when you see it in the flesh. My paint guy likes to spice things up, you should see the green see through bamboo one I did for a WA client. The next job done in 2 colour plus black pinstrips will be special as well. Wow that sure does look good. My next project might just have to be built with a nice piece of timber. That is some pretty paint, but have a heart he was beating up on us with the Falcon now you send this over to prolong our misery:) excellent build. I agree with Dig. AMO,AMO,AMO and more AMO. I sold my sporter a few years ago because I couldn't see with a six power scope. Now I have had my eyes fixed I would love to build a new sporter but getting a barrel is almost impossible. A shilen ratchet or a Muller is my wish but I think I would be too old to shoot by the time they were available here in Oz. Either of these barrels coupled to a Stiller 2500 X would be magic as the 2500 X in my opinion is the best, smooth as silk and true as a laser beam. However, we can all dream but I have a great rifle built on a 50 year old Annie 54 with a Shillen ratchet barrel. It will hold it's own against all comers. All I need is good Ammo so ammo is my top wish. If you are serious Knighty, I might just know where there is a rachet sporter barrel. Offer only valid for the southern chapter members of Team KAOS. I went to SISC last night with the purple Team 10X new build. Happy to say its an impressive rifle, I just guessed a tune setting shot nice groups with all 4 of my ammo options and shot tidy 248 with good X count in conditions and only 1 flag. Most important part of the test for me was to get a feel for the action. I really liked it, much nicer to use then my 3 lug turbo, the bolt lift was easier, the loading port is bigger and the feed ramp works well so really nice to shoot. I had concerns that the extractors not flicking the spent case clear of the loading port would be a problem, but the open loading port made it real easy to clear the brass, if you work the bolt back a little quicker the brass ejects easy. I think with just a little work I cound get the brass to flick out. Is it as smooth as a Stiller, no, but if you believe any of the 3 lug vs 2 lug or PAS vs SAP ignition stuff it gives us another action option, a much cheaper option at that. I will be ordering a bunch more and will have to keep one for me thus time.